Making a frock: nervous, a bit. The fabric is stretchy: a denim knit. 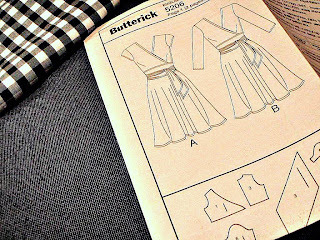 My pattern's a Butterick - 5206. The bodice needs changing; a bit of a fix. I've planned some darts, but will remove the zip. I'm making the waist somewhat thicker. But I'm kind of hesitating, you know. And the overlocker ... well, I don't mean to harp. OK I'll admit it - I'm deliberately stalling. My procrastination is really appalling. And what if all those changes create a big mess? Misses' dress, mid-knee length, has close-fitting mock wrap bodice, flared skirt, contrast binding, side zipper, sleeve variations and tie belt. Suitable for moderate stretch knits. (Available in sizes 8 - 24). Pictured above with black denim-look knit and black and white gingham for contrast binding. I love gingham, can't wait to see how your frock adjustments go. I'm too frightened to attempt a garment from the pattern let alone one with alterations! Good luck! Love the poetry - excellent procrastination strategy. Might pen some verse myself rather than starting 2010's projects. ... but you'll feel better about it once you get started & you're one clever person so you'll figure it out. its not knitting so no you can't frog it ! and if you stuff-up, remember to blog it! Ooh, I think you are very brave. Good luck. I'm with you on making the waist thicker though, and ditto on the reasons why! If you're leaving out the side zip don't make it too fitted! Good luck. You can do it! You will not frock it up if you take your time and carefully read the pattern! hehe i know what you mean. love the poem as part of the procrastination strategy, i am not that clever! what is the worst that can happen? you wreck a piece of fabric, but that isn't too bad, you can still use it for smaller projects! go for it!